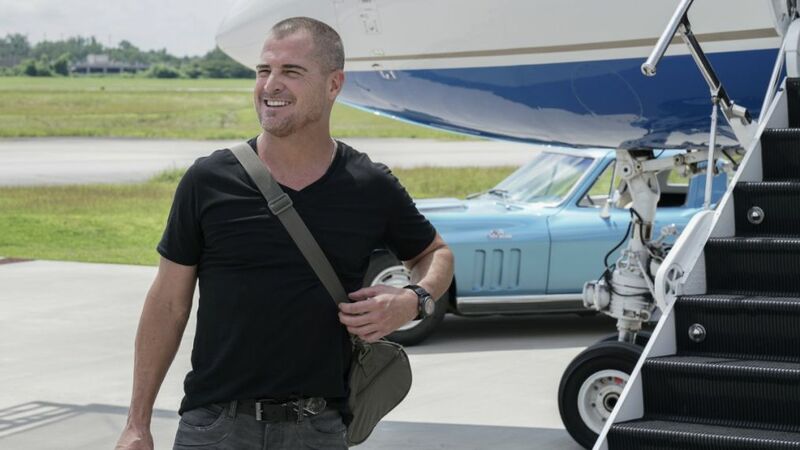 It was an emotional goodbye for George Eads' Jack Dalton as he exited MacGyver in the February 1 episode, "Father + Bride + Betrayal ." The actor, who has been with the show since the series premiered in 2016, departed when his character took an open-ended assignment to track down deadly terrorist Tiberius Kovac. And although the Phoenix Foundation team (and the fans) may think they won't see Jack Dalton again, star Justin Hires, who plays Bozer, may know better. After Eads' final episode (for now), Hires took to Instagram Live for a MacGyver Q&A, which included a question about Jack's status. "Is George Eads leaving?" the fan asked. "Technically," the actor started his response, "but you never know, he might come back." He continued, "I mean, George is leaving... I look at it as a break. I wouldn't be surprised if he came back." He starred in the CBS drama since its pilot in 2016. Hires shared the snippet of his Q&A on his Instagram profile, allowing fans to take what they will of his answer regarding Eads. Prior to Eads' departure, Hires also shared a few photos of himself behind the scenes with his now-former castmate. The first image was shared a day before Eads' final episode. Hires captioned, "Tomorrow ladies and gentlemen it goes down! Do not miss out!" And he wasn't wrong, Eads "last" episode was filled with plenty of action that fans have come to expect from the show, and it gave Jack Dalton a fitting send-off. Meanwhile, the day of the episode, Hires posted a second, more playful image of him with Eads. "Jack and Bozer on the attack laying down the law!," he wrote. With that, there's at least a little bit of hope for Jack Dalton to return to the Phoenix Foundation at some point. Until then, fans can anticipate Levy Tran's debut on the show as a new member of the Phoenix Foundation team, Desi.